There is a clear gender imbalance within the transport sector. Office of National Statistics (ONS) research suggests that from April to June 2015 there were 198,000 vehicle technicians employed or self-employed in Britain, all of whom were men. During the same period, 13,000 rail travel assistants were men, compared to 7,000 females who worked full-time as van drivers, according to the ONS. Fewer than two in every 10 rail industry employees are female, according to a comprehensive new survey into gender diversity across the sector. Men overwhelmingly dominate supply and train driver roles, with women occupying only 16.4% of jobs across the entire UK rail industry. Women are vastly under-represented in the rail driver sector. Only 4.2% of all train drivers are women, including just 33 female freight train drivers in the whole of the UK, equivalent to 1.4%. According to the latest figures from drivers' Union ASLEF, women make up less than 5% of those employed as drivers. 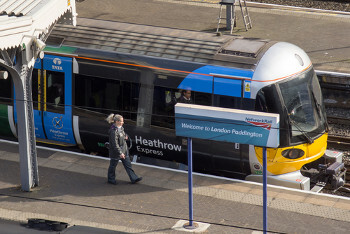 However, female drivers make up just over 40% of the shuttle team at Heathrow Express (pictured), the rail link connecting Heathrow Airport to central London. Work as a bus and coach driver employs 122,000 people in the role between April and June 2015. Of these 110,000 were men, of whom 95,000 were full-time, while 12,000 drivers were women, of whom only two thirds (8,000) were full-time. There are initiatives from both authorities and companies in the transport sector to try and raise the profile of women in transport and help boost numbers. In 2014 Transport for London launched the 100 years of Women in Transport’ programme, which celebrates the role women have played in the industry since the beginning of the First World War. The programme aims to attract more women to the transport workforce by highlighting the careers it has to offer. The lack of female bus and train drivers means the public are not often seeing women working within the transport industry. Captain David Morgan, director of flight operations at EasyJet said: ‘According to recent research conducted with our pilot community, a lack of female role models is a key reason that many girls and women do not consider a career as a pilot.